﻿ Riad Dubai Marrakech. JIMAT di Agoda.com! Ada soalan mengenai Riad Dubai? Dengan lokasi mudah di Marrakech, Riad Dubai adalah tempat yang hebat untuk menjelajahi bandar yang menarik ini. Dari sini, tetamu boleh menikmati akses mudah kepada semua yang bandar meriah ini boleh tawarkan. Hotel moden ini berada di sekitar kawasan tarikan bandar yang popular seperti Kasbah Artisanat, Complexe d'Artisanat, Gold&Coffee. Menawarkan tetamu hotel perkhidmatan yang unggul dan pelbagai kemudahan, Riad Dubai komited untuk memastikan penginapan anda berada di tahap seberapa selesa yang mungkin. Pilihan kemudahan kelas atasan seperti khidmat bilik 24 jam, Wi-Fi percuma semua bilik, pengawal keselamatan 24 jam, pengemasan harian, pendiang api boleh dinikmati di hotel. Semua bilik tetamu menawarkan pelbagai jenis tahap keselesaan. Banyak bilik turut menyediakan internet wayarles, internet wayarles (percuma), bilik larangan merokok, penyaman udara, pemanas untuk memuaskan hati tetamu. Sauna, rumah urut di hotel merupakan tempat yang ideal untuk anda relaks dan tenangkan diri selepas hari yang sibuk. Apabila anda mencari penginapan yang selesa dan mudah di Marrakech, ijadikan Riad Dubai sebagai rumah anda seperti berada di rumah sebenar. Location in Google Map is wrong, it's a residential house. Please change. Excellent - but make sure that you call the hotel in advance to arrange transportation. They say they have a shuttle bus but we did not use it. The official price for taxis from the airport is four times the going rate. 70/100 Dirhams for small/large taxis. You will need to get to the "Bab Ksiba" Gate and from there it is a five minute walk through the casbah. There are some signs but ALL the locals know where it is. Staff will meet you at Bab Kiba. Our stay here was lovely, the ryad is fantastic. Beautiful and authentic design, calm, yet very well situated for sight seing. The staff are lovely, very attentive and friendly. I definately recomend! Really nice stay. Breakfast is beautiful and served whenever. Staff are attentive and professional and rhetoric location is great! 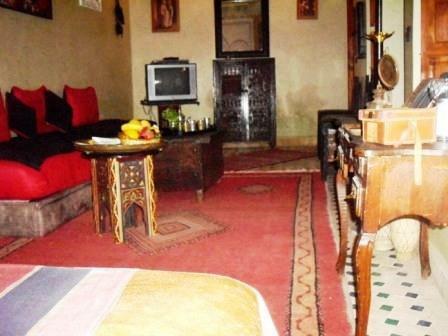 A very pleasant little Riad located in the Kasbah area of the Medina which is quiet yet still conveniently located for most of the major sights. Said, the manager was very helpful and went above and beyond to ensure that we had an enjoyable stay. The only complaint we had was that the wifi didn't work very well in the room but this was only a minor inconvenience. Overall I'd recommend the Riad Dubai without hesitation. this riad is small, 8? rooms, but with a very helpful owner and staff. make sure you email said, the owner, before arrival so he can arrange to pick you up. riad dubai is on a lane in the medina that does not allow cars and is difficult to find. it is in a neighbourhood, not touristy, which adds to the appeal. my room was good, lots of character, tv, wifi, and a/c. the breakfast was moroccan but i could get a boiled egg, sprinkled with cumin, a new experience to me but one i liked. it also included a dish of olives and moroccan pancakes and fruit. the dinner was very good too and can be eaten on the roof or in the courtyard. i needed a bus ticket to ouarzazate and then to essaouria, a bit complicated, and asked said for help. he not only helped but went to the station and got the tickets for me, avoiding mistakes i would have made. he also gives lots of advice according to the guest he is talking to. the younger people receiving different advice from the older ones and the advice is appropriate. it is in the medina but i found, for me, it was better to get a taxi, 30 mad, to the main square and then explore on foot from there. it was about a 20 minute walk to the square, for me, and i found it very interesting walk but then ran out of energy before i got there. however, there are great sidewalk cafes where for the price of a mint tea or coke, 12 mad, you can sit forever and people watch and rest. said, the owner, welcome us and gave us an overview of marrakech, where to go and what to do. his staff were always ready to help. 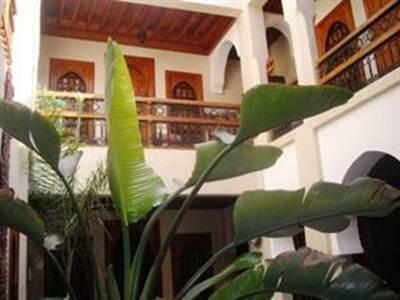 the location of the riad is very good, close to the main action points in town. just a 10 minutes walk from the main square. it is not that difficult to walk around and said can give you some tips not to get lost. Very comfortable. We had a welcome mint tea with the owner on a beautiful roof terrace with plenty information shared with us about Marrakech and Morocco. The food that was prepared for us was excellent, the rooms very comfortable and the staff very friendly and hospitable. Thank you also for the birthday cake that was supplied for my husbands birthday. What a surprise. Now that is service with a smile. Rent och snyggt. Vi stannade dock endast en natt för vi bokade en utfärd till Sahara och blev väckta tidigt med en god frukost redan kl 06:15. Personal, Sauberkeit,Grösse und Ausstattung des Zimmers. Äusserst zufriedenstellend. Das Personal war freundlich,höflich und zuvorkommend. Das Zimmer war geräumig,schön gestalltet, sauber und bequem. Insgeammt sehr nettes Hotel.ZU Fuss alles machbar. Guter Service und freundlich. Riad très agréable, confortable on se sentirai comme a la maison, très propre. Personnel disponible, chaleureux, accueillant et serviable. Riad situé au cœur de Marrakech endroit très calme et très joli. párommal együtt töltöttünk januárban pár napot a riad dubai-ban. a fogadtatás és a személyzet igen kedves volt, mindenben segítettek minket. a szállás egy családias hangulatú, kicsi szálloda. a szobák nagyon szépek, a helyi ízlésnek megfelelően vannak berendezve. a terasz egy kis paradicsomi idill, még januárban is. a szálloda a medinától nincs messze, gyalog bejárható minden érdekesebb látványosság. az ismerőseimnek feltétlenül ajánlani fogom ezt a szállodát. lehet hogy mi is visszatérünk?